Prime Minister Sheikh Hasina has drawn a picture on 'Muktijoddhya', the nation's War of Liberation in 1971. "With the assistance of eminent artist Shahbuddin Ahmed, the Prime Minister has drawn the painting. Sheikh Hasina has written her name on the canvas of the picture," Director of Fine Arts Division of Shilpakala Academy Ashraful Alam told. He said the painting, 42 inches in length and 36 inches in width, will be gifted to Prime Minister Sheikh Hasina. Red and black colors have been used for drawing the picture. 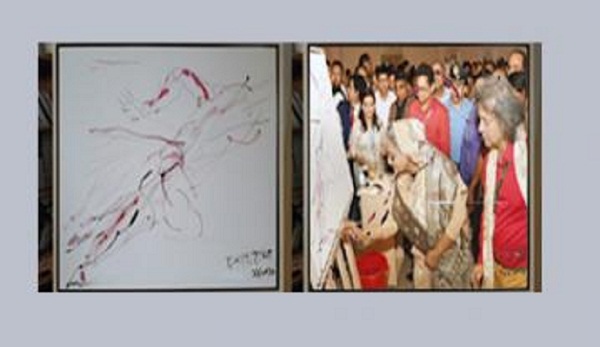 A portrait of a freedom fighter has been drawn by Prime Minister Sheikh Hasina with a paint brush.